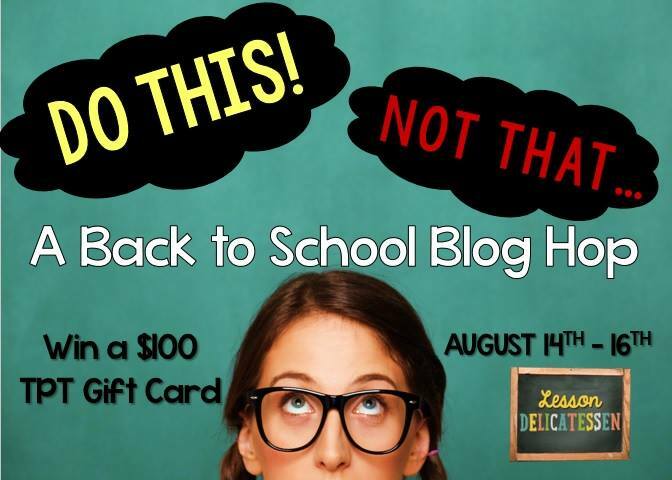 Welcome to the Test Prep Blog Hop from the ladies at The Lesson Deli! Here is how it works. 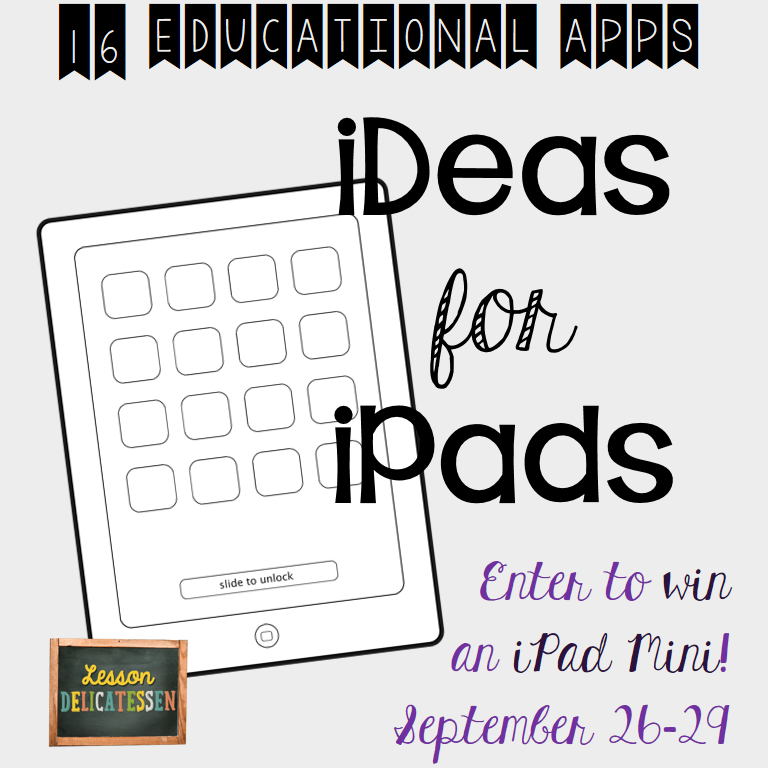 You will hop through a few blogs, pick up some freebies and maybe learn some test-prep tips, plus enter Rafflecopter drawings for some great prizes… Such as a Starbucks gift card to perk you up during testing season or an Amazon gift card to buy a few books for your classroom (or something for yourself!). The Rafflecopter contest runs from Thursday, August 26 through Sunday, March 1, 2015. Get to hoppin’ and have some fun! Oh, and if you’ve got a great test-prep tip, comment below! Here’s my close reading FREEBIE to help with test prep… Are you teaching students to analyze persuasive texts, identify examples of persuasive language and the effect that language has on the reader? Want to give students concrete examples of comparison, causality, parallelism, misleading statements, exaggerated statements, and contradictory statements using a high-interest text? Look no further! Here’s a new lesson, “A Baby Boa?,” with embedded test prep. The close reading passage is FREE below. Just click the image to download. You can find the foldable, skill activity, poster, vocabulary activity, and standardized test-prep reading comprehension questions that go with the passage in my TPT store. Click the image to download this FREEBIE close reading passage. For the foldable, skill activity, poster, vocabulary activity, and reading comprehension test prep that go with this passage, visit my TPT store. This passage can be used to teach persuasive techniques such as comparison, causality, parallelism, exaggerated statements, misleading statements, and contradictory statements. Ready to WIN a treat for your classroom? You can order books or spoil yourself with this Amazon gift card! You’re a teacher. You work HARD. You deserve it! CLICK a Rafflecopter giveaway to go to Rafflecopter’s site for a chance to win a $25 Amazon Gift Card. It’s easy and fun! Then go to the next stop in the hop, Simone’s Math Resources Blog, to see some MATH test prep ideas! Learning new words can be tough and things have changed a lot since I was in 5th grade over 20 years ago. I remember getting a list of words from my teacher and using the dictionary or textbook glossary to copy the definitions verbatim from the book. Sometimes we would write the definition a few times or use the new terms to fill in the blanks. If we were lucky, we got to write a sentence with all 20 words for homework on Tuesday night. Now, those activities still have their place. There are times when using words in sentences and locating definitions is necessary and important, but I’ve learned after several years of teaching that those activities alone aren’t sticky, meaning that they don’t help students get to know and use new words. 1. Maximum Exposure–If they can see it, use it, touch it, etc. they are more likely to understand it. You and I know that a delta is a landform built up when sediment is dropped off at the mouth of a river, right? But what does that look like? How does the sediment get there? Will I ever get to see a delta if I live in west Texas? Simply showing a satellite photo of a few major deltas in the world can make this term come alive for students. Pull up an image of the Lena Delta from the Nasa Earth Observatory and talk about it. But, don’t just show them one delta. Then pull up an image of a different delta and observe, discuss, and sketch a diagram in science notebooks. Perhaps the Mississippi Delta in Louisiana. That second photo will help the new word stick. Why? Because now they have enough background to really analyze the Mississippi Delta and start asking some questions. They’ve seen one and can now make connections between the two pictures. 2. Variety is the Spice of Life–And also the spice of vocabulary instruction. If you use the same strategies for every word, every time, students get bored. Mix things up. The human brain perks up when something novel is happening. Use actions to represent words like predator (show claws and fangs) and prey (hands together like saying a prayer “Please don’t let me get eaten.”). Take student outside with hand lenses to look at the sediments in the sidewalk when talking about cementation. Hold a debate about whether their are more magnetic things in the room or more non-magnetic things. 3. Real-World Meanings–Sometimes giving an example or describing a word is more helpful than defining it. When learning new words, I like to get students to record what they think will help them remember what the word means, and that isn’t always just the definition. 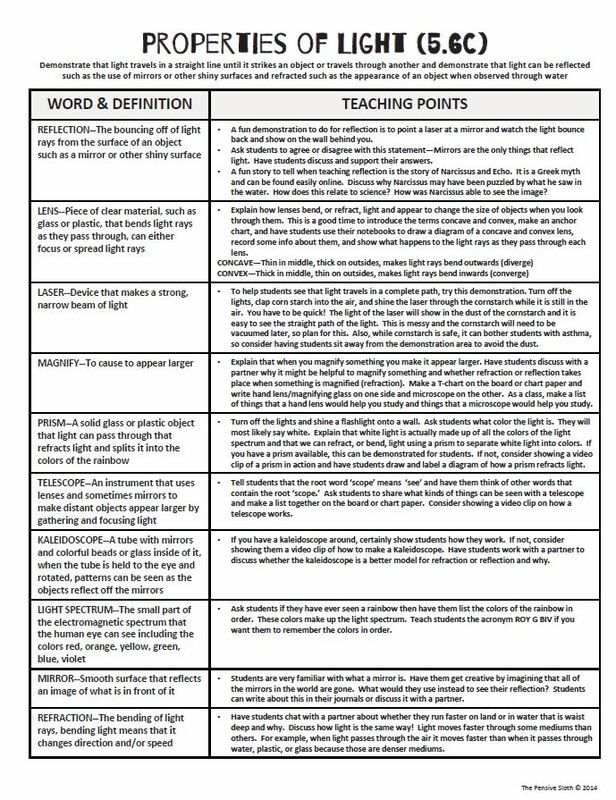 Model different ways to get to know new words and encourage students to write meanings that make sense to them, not just definitions. 4. YouTube–If you’ve read some of my other posts you know that I love using YouTube in the classroom. There are some things that can only be experienced live, and YouTube is the closest to live that we’ve got to observe such things as the tides coming in and out or a glacier moving over time. Give it a try! A 30 second clip can make a word of difference. Looking to make vocabulary instruction come alive in your science classroom? 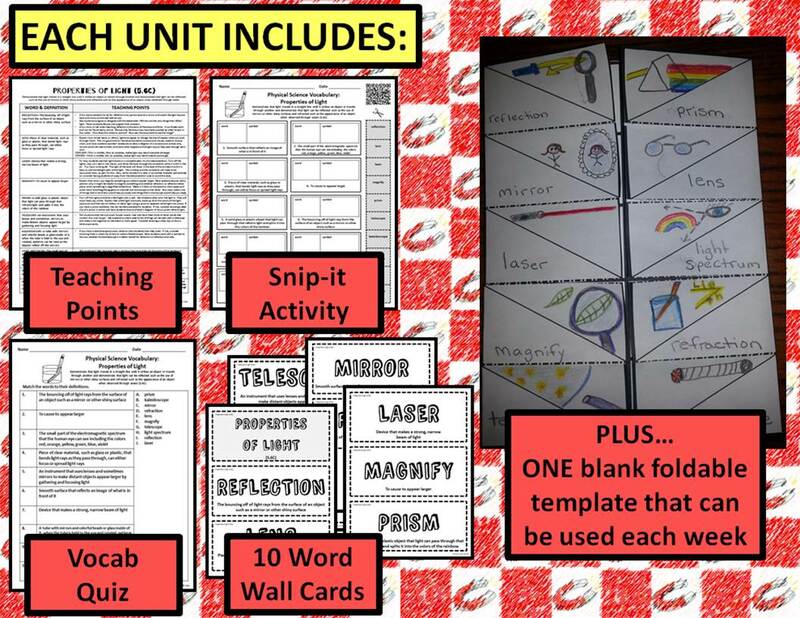 How about a freebie for teaching properties of light that includes a foldable, cut and paste activity, quiz, AND teaching points for bringing vocabulary alive in the classroom! Click the image to download a vocabulary unit for teaching Properties of Light. Plus, from NOW until January 4th, 2015. my science vocabulary units are on sale for only a dollar! Next stop…Misty Miller of Little Room Under the Stairs!When you make it through the whole hop, you will land at The Lesson Deli page where you can enter to win a $50 Target gift card! Best of luck and happy new year! 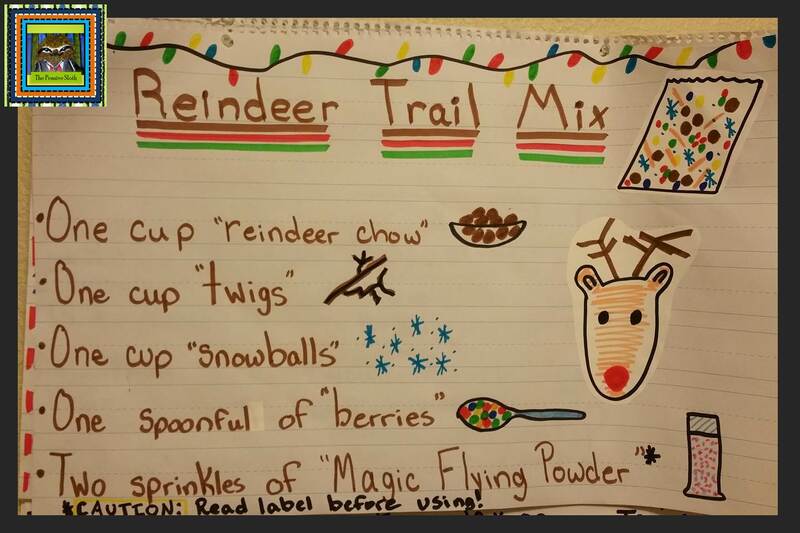 Reindeer Trail Mix…and an Amazon Gift Card Giveaway! 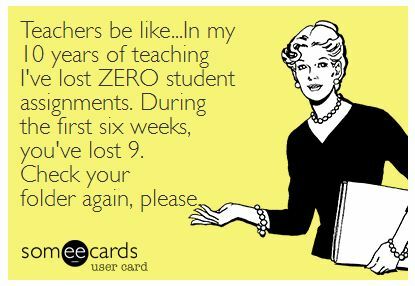 The kiddos know it is just their teacher being goofy, but they love to break the rules and over sprinkle, then joke about how they used so much that they will probably end up on Jupiter. It’s fun for all! HINT: Buy an extra bottle of the “Magic Flying Powder” and keep it hidden. Almost every year there are a few students who go way overboard and I run out, which makes those last kiddos to make the trail mix sad. If that happens, you can pull out your extra bottle and brighten their day! How would an Amazon gift card help? 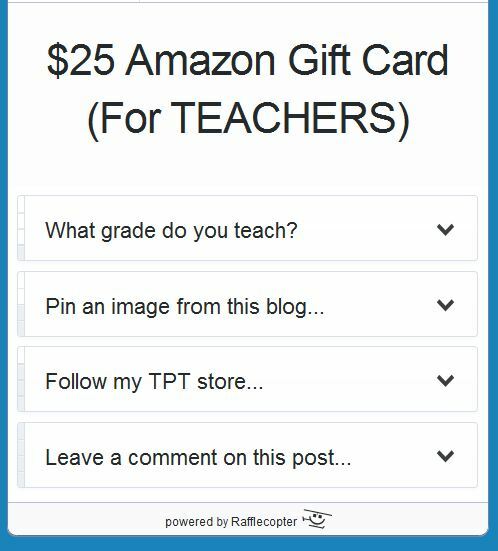 A teacher blogger friend of mine is hosting a giveaway for a $65 Amazon gift card. Entering is easy. Click the picture below and head on over to NC Teacher Chick’s blog where a Rafflecopter is waiting for your entry. The giveaway runs Tuesday December 16 through Sunday December 20, 2014. Good luck! 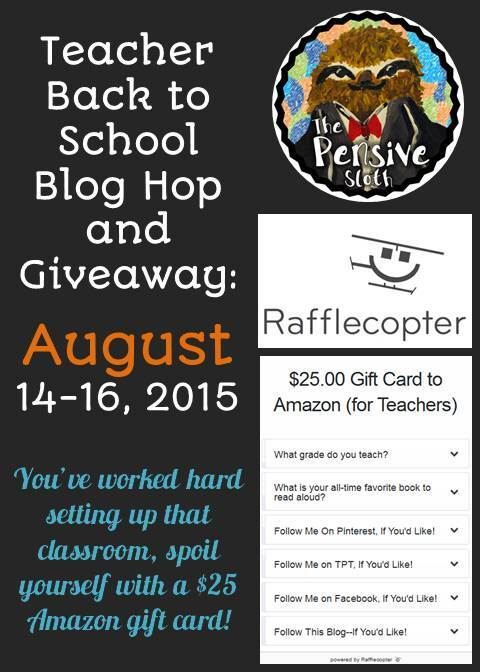 Click the image to visit NC Teacher Chick’s blog and enter the Rafflecopter giveaway. The giveaway runs Tuesday December 16 through Saturday December 20, 2014. Good luck! 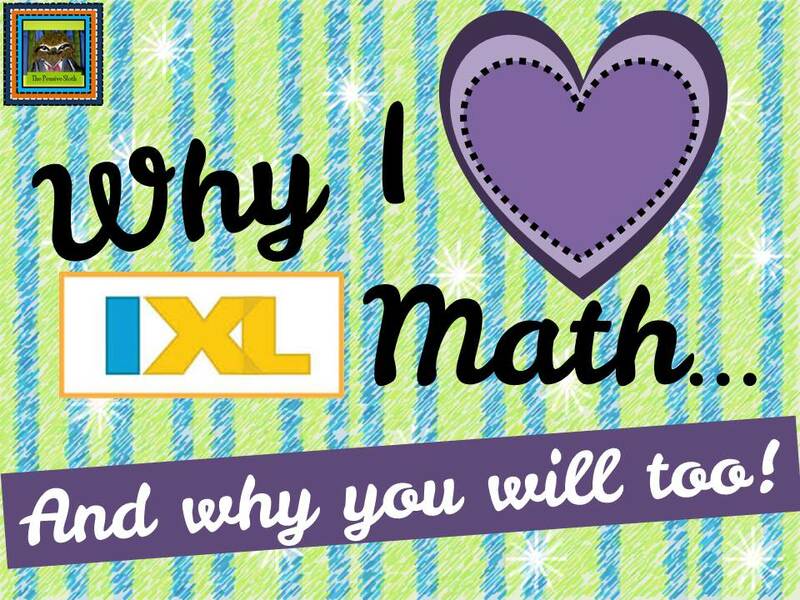 A blogger friend of mine, Simone’s Math Resources, is celebrating an anniversary of sorts–Five years of creating math resources on Teachers Pay Teachers. That’s right. 5 years! In honor of this, she is hosting a giveaway of teacher resources for 4th through 8th grade teachers. There are three giveaways, so check them all out and click on the Rafflecopter link below each prize pack to enter. The giveaway runs September 14th to 20th, 2014. Good luck all! PS–I’m part of the 2nd prize pack! 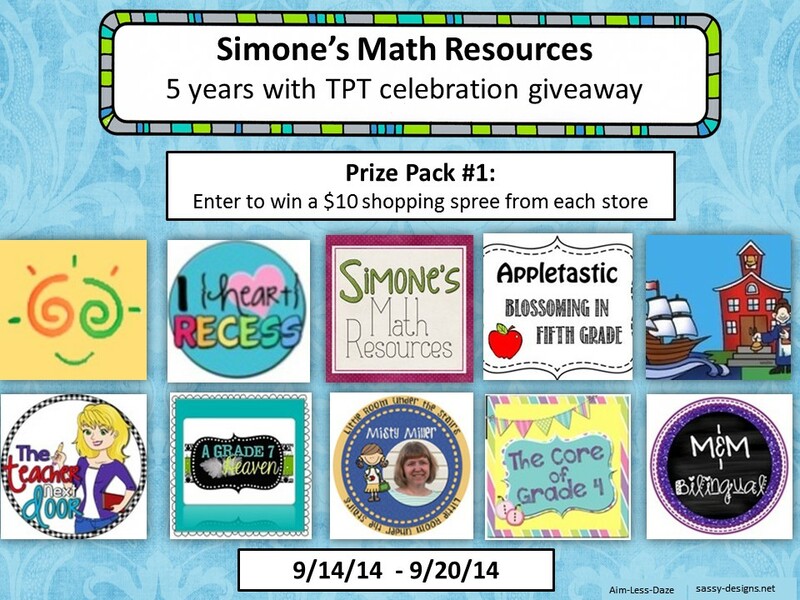 Giveaway 1 from Simone’s Math Resources–Sept. 14-20, 2014. 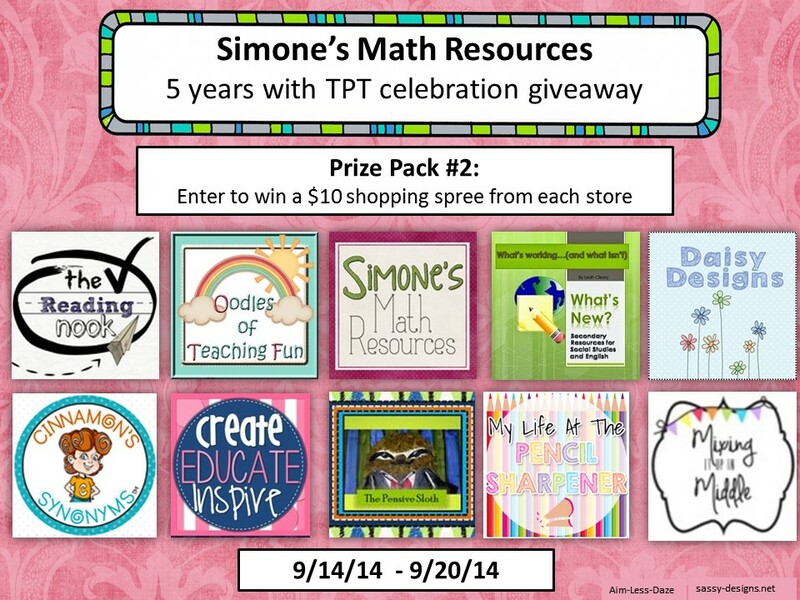 Giveaway 2 from Simone’s Math Resources–Sept. 14-20, 2014. 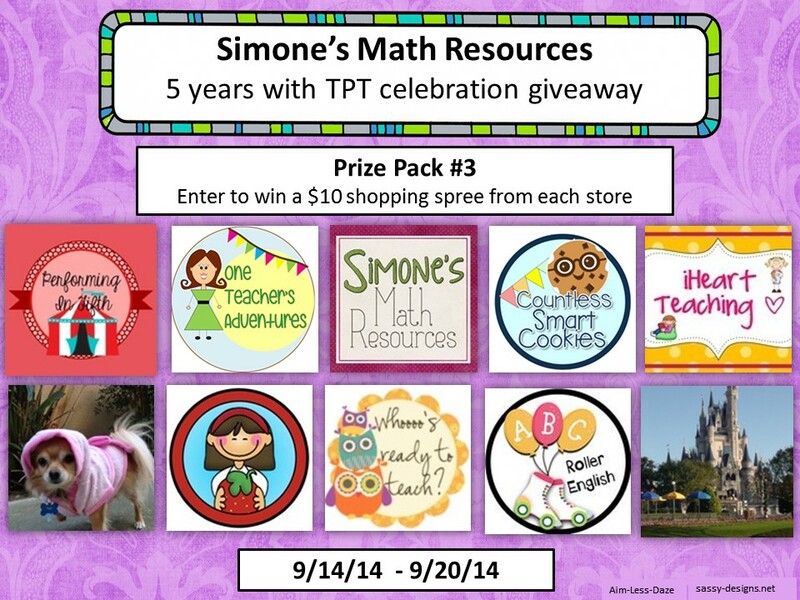 Giveaway 3 from Simone’s Math Resources–Sept. 14-20, 2014. Are you ready for Back to School? I’m joining several other upper grade teachers to help you get ready for the next school year, and to give away some AWESOME prizes! You’ll have the opportunity to win something different on each blog in our group, so make sure that you visit the next blog in the blog hop at the bottom of this page. To enter to win the HUGE gift certificate to Teachers Pay Teachers, visit our group blog, Lesson Delicatessen. Make sure you hop through all the blogs to read all the great back to school tips and be entered to win over 20 different prizes! UPDATE–Congratulations Cora B.! You’ve won The Pensive Sloth’s Rafflecopter giveaway. You should have received an email with instructions on claiming your prize. Thanks to all who entered and hopped along. Have a great beginning of the year! School is just around the corner and in no time at all there will be 25 nervous, smiling, excited little people sitting in front of you. Put some STEM into your first week back by having your upper elementary students engage in LITERAL team building. Here’s how it works. Put students in groups of 2-4 and give each group a stack of index cards. You can start with 30 per group, but have many more available just in case! Their goal is to work together to build a structure that is 10 inches tall using ONLY the index cards. No tape or glue! The catch is, on each card students must write something that their group has in common. You can add additional rules based on your class. I love watching how as students want more cards to build with, they work hard to find creative things they have in common (even if it is that they all breathe oxygen). 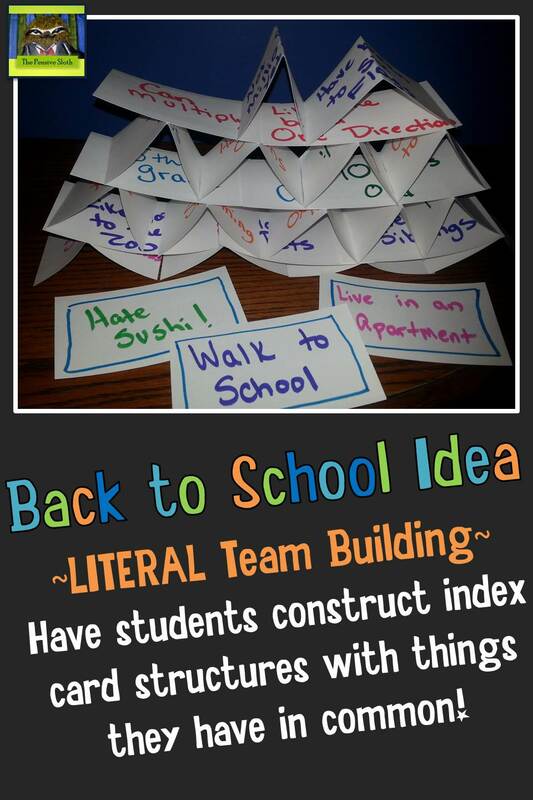 Back to School STEM Fun–Literal Team Building! Enter The Pensive Sloth’s Rafflecopter giveaway by clicking the Rafflecopter link below. I’m giving away $10 winner’s choice from my TPT store and a $20 gift card to Oriental Trading. There are 4 ways to win. Good luck! Then…hop on over to Rockin’ Resources for more back to school ideas and a chance to win some writing resources! And don’t forget to visit The Lesson Delicatessen for a chance to win a $50 gift certificate to Teachers Pay Teachers! THE PENSIVE SLOTH’S GIVEAWAY TERMS AND CONDITIONS–This giveaway runs August 4-10, 2014 and includes up to $10 of products from The Pensive Sloth’s TPT page and a $20 e-gift certificate from Oriental Trading. Once a winner is chosen at random through Rafflecopter, the winner will have 24 hours to claim his/her prize. If the winner does not claim the prize within 24 hours, I will spin again and contact the next person. Please feel free to contact me at pensivesloth@gmail.com if you have questions. Good luck!